Last weekend, I was privileged enough to attend the Slow Sips and Charcuterie Snacking workshop as part of Slow Food Nation (for full disclosure Foodbuzz purchased my ticket on the condition that I would write something about it). In actuality, Angela and I were only coincidentally in San Francisco for the weekend but it was nice to have the opportunity to attend. My ever so brief synopsis can be boiled down to the fact that Medlock Ames has some nice wines (the Rose, which was specially crafted to pair well with Charcuterie, is quite nice), Boccalone has a decent mortadella, and Surry Farms “Surry”-ano is the best ham I’ve ever eaten. It was better than any Italian prosciutto or Spanish serrano than I’ve had. The “problem” with the mortadella was that it was far outshone by the ham. While the workshop was technically about wine and charcuterie, the real theme (like much of Slow Food Nation) was about sustainable farming practices. All three producers (Ames Morrison, Ed Surry, and Mark Pastore) discussed how they incorporated sustainable practices and how they were actually important to them. But the event got me thinking about the whole concept of sustainability. I think that sustainability is a noble goal. I think it’s something to strive for. But, with all do respect to those who attempt to practice it, I think we’re, in many ways, missing the point. Ames Morrison talked about how their first year they had to build lots of terraces with Kubota tractor. How sustainable are they? Ed Surry is from Virginia and had to get on an airplane (bringing a in-the-process of curing ham) to get to Slow Food Nation. Mark Pastore also has a restaurant, Incanto, which only serves Italian wines which means they must be transported long distances (under controlled conditions) to get there. I don’t mean to single those three out. Not unsurprisingly, I had to take an airplane to get there. A larger portion of my food than I want to admit comes from farther away than it should. Let alone the distinct lack of sustainability of the iPhone I purchased over the weekend. I really do applaud what all those who strive for true sustainability are doing. But aren’t we all missing the bigger picture? Does it matter if my produce is sustainable if I’m driving to work every day? Does it matter if I keep buying the latest gadget? The food industry, in many ways, including this push for sustainability, is attempting (and, surprisingly, succeeding) in undoing the industrial revolution. We concede to go along with it because we feel we get a better product, it’s better for the environment, and, the part that’s frequently missing from such calculations, we’re rich enough to afford it. But that won’t be true of everything we consume. Much of what we use and consume is heavily industrialized. We very much live in a throw away society using cheap labor from abroad, almost none of which is sustainable. Eventually, we will be forced to make tradeoffs. We will be forced to give things up. We won’t be able to afford everything we want. And when we look at the balance, we will be paying a very heavy price for sustainability. So where does that leave us? I really don’t know. The issue extends far beyond food but the ramifications are huge. I doubt our society is truly capable of living sustainably. I suggest for now that we do what we can within our individual limitations. Some pasta dishes can only be described as strange. Perhaps I should explain that a bit better. There was a time when, to me, pasta meant tomato sauce (as further proof, I almost called it “spaghetti sauce”). And the tomato sauce came in a can and got mixed with sautéed ground beef. Then I discovered alfredo sauce and had multiple choices for my pasta. But, I then went to Italy and realized that there were nearly an infinite number of choices of pasta sauces. This is still the strangest. I’m probably one of the three people in the United States who likes anchovies. I think they can add a unique flavor to foods. However, I’m still a bit hesitant about any food that tastes primarily of anchovies. And that’s what makes this strange. 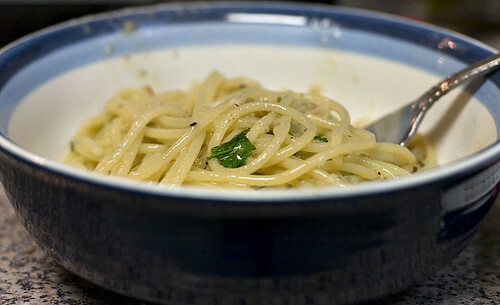 I was hesitant to even post this recipe here but, when I thought about it, I rather liked Spaghetti alla Carretiera. It’s strange but then again so am I (as my wife will most certainly corroborate) and I consider my strangeness to be an endearing quality. It’s the same with the pasta. Yes, it tastes primarily of anchovies. But it’s not objectionable (well, it was to Angela but that’s beside the point). It’s different but that’s why I like it not in spite of it. De-bone the anchovy fillet and soak in the milk for 10 minutes. Discard the milk and dry the anchovy well. Chop the anchovy. Cook the pasta in boiling, salted water for 1 minute less than the directions. Drain the pasta and reserve at least 1 cup of cooking water. While the pasta is cooking, heat the olive oil in a skillet over medium heat. When the oil is hot, add the bread crumbs and cook, stirring, for 5 to 10 seconds. Remove the skillet from the heat. Season the sauce with salt and pepper to taste. Add the anchovies, garlic, and red pepper flakes to the skillet and stir for 20 seconds. When the pasta is finished, add 1/2 cup of pasta water to the skillet. Add the spaghetti to the skillet and bring to the simmer. Cook for 1 minute until the sauce is thick and coating the pasta well. 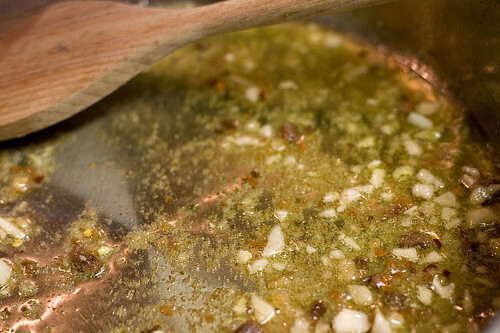 Remove the skillet from the heat and add the parsley. Don’t worry, I’m not dead. Family was in town for Thanksgiving and I was on travel for work so I didn’t have time post anything. I do, however, have a story about our Thanksgiving for you. Imagine, if you will, that you are a recently married and hosting the family Thanksgiving for the very first time. You also tend to take food a little bit too seriously. Now imagine what’s one of the worst things that could happen to you? If you guessed the oven breaking the day before Thanksgiving, you are correct. I was baking a green tomato mince pie Wednesday afternoon at which point the oven failed. It’s a gas oven with an electric igniter. While the igniter was on, there was no gas coming out (I checked with an electric stick lighter). And, most unfortunately, it failed too late to call our apartment maintenance staff to come and fix it (I tried calling the after-hours number but nothing came of it). What to do at this point? I tried to come up with a way to cook a turkey on the stove top but I pretty quickly realized my largest pan wouldn’t hold it and my only real option there was to quarter it (and, really, it’s Thanksgiving and roast turkey is traditional). How to make Thanksgiving dinner under such conditions? We did the only thing we could: we loaded all our supplies into the car and drove to my 8-month pregnant cousin’s house. I took just about everything I could imagine needing as I had no idea what she had. I brought all the food I needed as well as pots, knives, and even a few specialty items like my food mill. And while I hate to be a braggart, it turned out really well. There was more than enough food (I think we could’ve easily fed at least double the amount of people). And we really did have a good time even if it wasn’t how we expected. I do need to call special attention to the turkey. Normally, for me, turkey is something you eat on Thanksgiving because it’s what you eat on Thanksgiving. It’s never particularly good but it’s at least edible. Not this year. This was, by far, the best turkey I’ve ever had. I don’t know if it was because we got an all-natural free range turkey I ordered from our local butcher shop (and, yes, I think the name is silly too) or if it was the brine I used (from Charcuterie). Either way, it was really good. Eventually I’ll post the recipe. 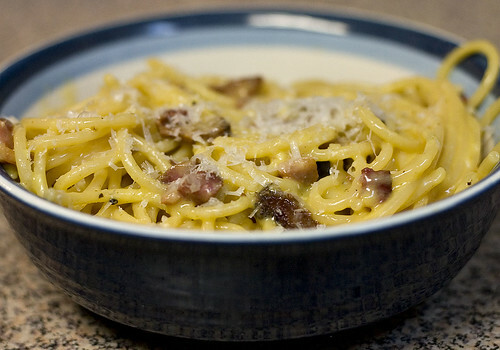 I was correct: Spaghetti alla Carbonara is much better with homemade pancetta. I received a promotional offer from Bon Appétit in the mail the other day. It was offering a year’s subscription for $12. What confused me was that it was listed as a non-transferable special offer for “professionals.” Exactly what type of professionals is their target market? Is there really a dearth of engineers that read the magazine? Or is it enough that you call yourself a professional? I think I’ll be a professional elephant wrangler from now on (I’m waiting for the special offer from Elephant Wrangler’s Monthly). And, yes, I subscribed. I mean, it was only $12. So maybe they should continue the promotion as it seems to be working. While shopping at Costco today, I ended up buying myself a new toy. In my defense, Angela actually suggested buying it because we weren’t certain how much longer Costco would be selling them (we had only gone there to get hand soap and cat food I swear!). 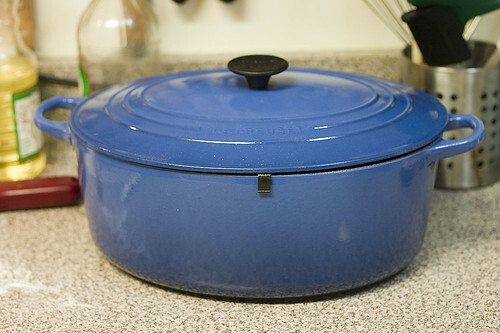 I’ve always (where always=since I really started cooking a few years ago) wanted one and almost bought an off brand one at Marshall’s last weekend. So now I just have to come up with a nice braised dish to make in the near future. On a side note, if you’re interested in picking up Mastering the Art of French Cooking by Julia Child, et al (and you really should if you don’t own it), Volumes 1 and 2 are only $25 at Costco (well, the one near us) which is quite the steal as each volume usually retails for that price.